Physical solutions range from simple (installing sound-absorption or re-positioning speakers) to complex (altering the position of a stage or the layout of the venue). Other options involve taking a collaborative approach to managing sound levels. The concept of decibel banking has been used in Europe for several years and was a topic of discussion at the Sound Check Symposium. 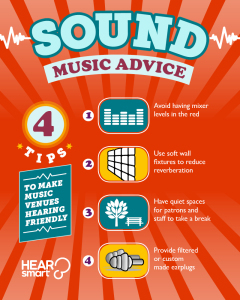 Music Victoria’s Best Practice for Live Music Venues includes information on managing sound levels and hearing health. Sound Advice in the UK provides comprehensive advice about managing sound levels in Amplified music played in nightclubs, bars, pubs and restaurants. The US document titled: Workplace Solutions: Reducing the Risk of Hearing Disorders among Musicians also provides some more information and ideas. 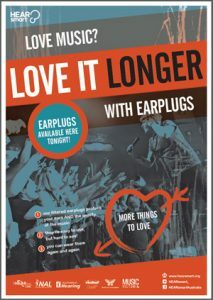 Looking for a poster to advertise availability of earplugs at your venue?